Does a luxury Caribbean vacation await you? The combination of an island escape with luxury accommodations is hard to ignore. Destination clubs have made their mark all over the Caribbean. Some locations are more popular with anywhere from eight clubs to only one on any given island. We have made a list of the most popular sites for destination clubs starting with everyone's favorite, The Bahamas, and ending with the small, remote island of Anguilla. 1. The Bahamas is the sure winner with residences for 8 destination clubs lining the beaches (Ultimate Escapes, The Lusso Collection, Solstice, The Oyster Circle, Abercrombie and Kent and Exclusive Resorts). Most of the homes are based at the Abaco Club at Winding Bay on the island of Great Abaco. The Solstice yacht is based in Nassau the capital of the Bahamas. Island Features Only 50 miles off the Florida coast, The Bahamas offer a close Caribbean retreat. There are 23 inhabited islands on this island chain and hundreds, if not thousands, of unpopulated ones. The calm waters and cooling trade winds make The Bahamas a restful, peaceful place to visit. However, for those who like adventure and sport The Bahamas will not disappoint. Nassau, the capital of The Bahamas has a charming old-town feel. The Abacos is a group of islands that curve over 130 miles, have small quaint villages with New England-style buildings and plenty of boats floating in the harbors. The Exuma islands also stretch for 130 miles with perfect waters for sailing and yachting. 2. The Turks & Caicos come in second with seven clubs having residences (Lusso, Quintess, Ultimate Escapes, Yellowstone Club World, Equity Estates, High Country Club and Exclusive Resorts) all located on Providenciales. Quintess is also building some new homes on West Caicos. Island Features Located 600 miles southeast of Miami, the Turks and Caicos Islands are a hot spot for ocean-loving visitors. The several hundred miles of coral reef have landed the islands on the top 10 dive list. Although the islands in this group are too numerous to count, there are eight inhabited islands including Providenciales, which is the most popular location. 3. The U.S. Virgin Islands is home to two luxury destination clubs - Ultimate Escapes and Quintess - who both have spectacular homes on St. Thomas. Island Features The US Virgin Islands boast of their culturally diverse and friendly locals. Like many other Caribbean destinations, the Virgin Islands have beautiful beaches, ideal weather and clear waters. The islands host a variety of activities in addition to all the water sports you can imagine, guests can explore tropical forests and national parks. St. Thomas, where most of the DCs are located, is host to local arts, entertainment and shopping. 4. The Dominican Republic has lured Quintess, Ultimate Escapes and Abercrombie and Kent to the lovely beaches of Punta Cana. Island Features Christopher Columbus discovered this lovely island during his first voyage to the New World. It's a wonder why he continued on at all. This island is rich in history and cultural influences. Visitors to the island are warmed by the vibrant colors of the local arts and entertainment, inviting landscape views, exotic cuisine and rich heritage. Of course there are also plenty of beaches to enjoy a day in the surf and sun. 5. St. Vincent & The Grenadines has attracted Quintess and Exclusive Resorts to the beauty of Canouan Island. Island Features Canouan Island is easy to get around and measures only 3.5 miles by 1.25 miles. Canouan is also an easy place to set sail from and visit neighboring islands. For instance, the Tobago Cays are known for excellent snorkeling and diving. The Islands brag of their world-class sailing waters-perfect for a boating vacation. 6. 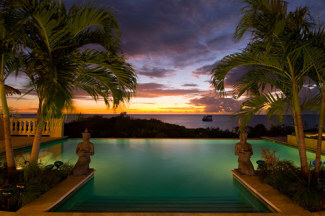 Anguilla is a fine choice for Exclusive Resorts and Lusso to offer destinations in the British West Indies. Island Features A small island in the northern Caribbean, Anguilla has plenty of options for visitors. The island is 16 miles by 3 miles and has 33 white sand beaches. Even with its growing popularity, this remote island has managed to retain a simple charm. As for activities, guests can enjoy sailing, snorkeling, horseback riding, local music and entertainment, historic sites and museums, and excursions to an undersea world. 7. The Yachts. If you simply can't choose one island to stay at, vacationing on the water itself might just be the answer. Clubs with yachts and/or sail boats as a destination option in the Caribbean are Quintess, Solstice, Ultimate Escapes and soon Distinctive Holiday Homes. With all the excellent diving, cuisine, entertainment and shopping that the Caribbean has to offer, maybe the best way to experience it all is on a private yacht, which lets you sample many of the islands in one relaxing experience. There are several other islands throughout the Caribbean that are home to just one destination club, including Nevis, Barbados, St Barths and the Cayman islands. And with the constant appeal of those clear translucent waters and pristine beaches, nearly all the clubs have new Caribbean residences in their future plans with many actively in development.